I’ve seen those Romanesco broccoli in the seed catalogs, but have never grown them. They are very cool looking. My broccoli heads never get anywhere near as large as the ones in the store. Do you have any advice for growing large heads of broccoli? Hi Fritz: the ones in the store are selected to grow big heads like that. Usually the home-grown broccoli seed is multiple-heading, meaning that the side shoots are the aim of the harvest, not the puny center head. That said, some years I get decent-sized heads on broccoli, too: all the cabbage crops are nutrient hogs, frankly; side-dressing them with compost seems to help, but you have to get the timing right. I try to get the well-rotted compost out and scattered when the cabbage family has about eight leaves on them to give them a boost. Compost tea, too, when they’re first flowering. Thanks. Since I don’t produce those big heads, I’ve been selecting my broccoli for the abundance of side shoots instead. So I guess I’m doing that right. I do have plenty of compost in my beds. But based on some other growth, I may be a bit light on nitrogen. I’m attempting to organically add nitrogen. When I put in a new bed, beans are what goes in there first all the time. I’m also going to be adding blood & Bone meal this fall. But I haven’t yet. Thanks again. 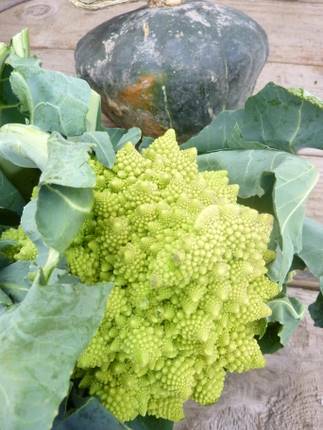 I love that romanesco. Mine were a disappointment last year — at the rate I’m going I’m going to have to focus on NEXT year, I believe. So very very pretty. I think my taste buds have shifted to appreciate bitters more than they had before as I aged. It’s a nice phenomenon. I sort of wish we had freezes. We just planted Brussel sprouts and lettuce plants last weekend, along with seeds for turnip tops, kale, chard, mustard, and beets. Also trying carrots to see if they’ll grow in the winter here. Going to try shallot seeds from Paula to see if they’ll grow, and grow in the winter. Still have multiplying onions and garlic to get in the ground. And my jalapenos are still producing, once I hacked them back and picked all the fruit. Winter garden, here we come!!! Very cool. My only summer veggies that are producing are the jalapenos and the okra are maturing seeds. I got my garlic in the ground on Oct 1. The potato onions will go in over the next couple weeks. That is truly a thing of beauty!! Lovely! I’m waiting on my lone cauliflower head who is happily getting bigger every day (in the hoop). I thought of you while picking sad and wormy kale the other day, ugly harvests indeed. I gave up and Btd the indoor plants, but outside it’s worm city! Your beautiful broccoli is the snow flake of the broccoli family-such detail! Fritz, yeah, I think sometimes plants have a Goldilocks fetish: just enough, just right, or else we won’t grow. Sometimes I hit the sweet spot and they do well, sometimes not, and frustratingly it’s often in the same bed, so there goes my theory of control…! Anyway, because cabbage family crops are fairly heavy feeders, any good amendment should help you. Stefani, sometimes it’s just fine to say “next year” to everything. So many oaths, so little time. Plus, you’re busy! Kara, don’t be too impressed; the road to this one is filled with lots of failed attempts. But it is cool, eh? Jillian, do. My experience is they’re more tender than cauliflower, and taste very mild compared to either broccoli or cauliflower. Sara, good: glad you went the Bt route. Really. Annette, I would think that’s horribly frustrating. It’s my situation too so I just go out and shake more on after the rain…seems to work okay, just need to wash the powder off. I just found your website! I’m a new blogger looking for other gardeners to kibbutz with, especially from the north. We’re zone 4 which can be rough sometimes. 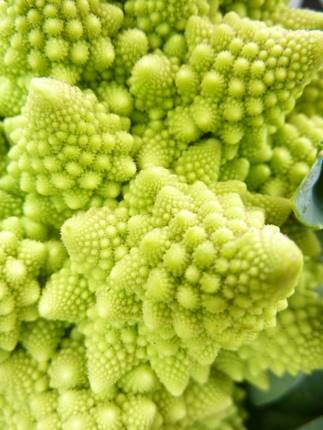 I just wanted to say your Romanesco closeup photo is truly amazing. Isn’t there some kind of Golden Ratio thing that explains the beautiful swirling complexity of it? I have to find that book and read it this winter. From what I gather on your comments that is a hard to grow var. so congratulations! We have mixed results with our broccoli and haven’t tried that one. But E loves cauliflower so we may give it a go! Hi Gus! Welcome to blogging, and it sounds like country living and gardening, too. I adore comments and answer every one, usually on Mondays after I post, except on occasion I’ll pipe up during the week. I do believe you’re right and it could be the golden mean. It certainly is fun to look at, these zany broccoflowerythings. El, as a reader, I love that you respond to every comment. As a blogger, I do the same thing, always respond to comments. To me, that is the least that I can do to thank the commenter for visiting my blog and contributing. Unfortunately, there are a lot of bloggers that take their readers for granted.